Zimbabwe is a young country that nonetheless has one of the oldest, most fabled and romantic histories in all of Africa. Despite the politics, Zimbabweans have endured. The tourist infrastructure has never been stronger, and the guides remain among the best trained in Africa. Largely unspoiled and teeming with wildlife, Zimbabwe is unmistakably still the best of real Africa. From the mighty Victoria Falls, to pristine game parks and the rolling hills of the Eastern Highlands, and the rock art of the Matobo region, Zimbabwe is a breathtakingly beautiful country. The visitor to Zimbabwe is likely to see a diversity of habitats offering sights such as giant baobab trees, picturesque river fronts, large herds of elephant and buffalo, sable and roan antelope and a variety of predators. The bird life is rich and numerous. Zimbabwe’s natural heritage remains its greatest treasure, along with its friendly, welcoming people. The country offers a diversity of safari experiences, including walking, game drives, canoeing, rafting, elephant and horseback trails, sailing, tiger-fishing, house-boating and more – Zimbabwe is sure to fulfill your African dreams. Location: Zimbabwe is a landlocked country in southern Africa, it lies between Zambia and South Africa, with Mozambique to its east, and Botswana to its west. Size: Zimbabwe covers 150,800 square miles, slightly larger than Montana, US, about the same size as Japan and slightly larger than Germany. Population: Around 14 million people live in Zimbabwe. Languages: Zimbabwe’s official language is English, and the majority of Zimbabweans speak either Shona or Sindebele (the language of the Ndebele, sometimes called Ndebele). Besides this, there are numerous local dialects. The Flag: The flag of Zimbabwe was adopted when the nation won independence from Britain in 1980. The soapstone bird featured on the flag represents a statuette of a bird found at the ruins of Great Zimbabwe. The bird symbolizes the history of Zimbabwe; the red star beneath it symbolizes Marxism, and the revolutionary struggle for freedom and peace. The colors represent the land (green), people (black), minerals (gold) and blood (red) spilled during the struggle for independence. Currency: The US Dollar is the official currency used in Zimbabwe (since 2009). Getting to Zimbabwe: The main points of entry for travelers from the US are Harare (HRE) and Victoria Falls (VFA), but there are no direct flights available. South African Airways and Air Zimbabwe operate daily flights between Johannesburg and Harare as well as Victoria Falls. Emirates and Ethiopian Airlines fly into Harare as well. The land border crossing between Zambia (over the Victoria Falls Bridge) and Botswana (Kasane) also offer convenient entry points into Zimbabwe. (link to four corners). Movies/Documentaries: Mugabe and the White African (2009) by Lucy Bailey and Andrew Thompson; Music by Prudence (2010) by Roger Ross Williams. On Zimbabwe’s eastern border, running some three hundred kilometers from north to south is a string of mountains quite striking in its rugged beauty. Forming a natural border with neighboring Mozambique, the Eastern Highlands vary from the gentle rolling countryside near Nyanga in the north to the fierce granite spikes of Chimanimani. Some of Zimbabwe’s most breathtaking scenery is found in this region of soaring peaks towering over dramatic landscapes more reminiscent of the Scottish Highlands than of Africa, except the red deer have been replaced by herds of antelope. Winding roads lead up to country inns and golf, trout fishing and horseback riding are serious pastimes in these parts throughout the year. Further south of Nyanga are the Vumba, an archipelago of misty peaks famed for their fabulous view into Mozambique. They are also home to the Vumba Botanical Gardens, just a short drive from the eastern ‘metropolis’ of Mutare, containing shrubs and trees that have been gathered from all over the world. In the southeastern corner of Zimbabwe lies an area known as the lowveld which contains several prominent wildlife reserves. These include Gonarezhou National Park, the Lonestar Reserve, and the Save Valley Conservancy. The Lonestar Reserve is a privately owned game reserve 98,000 acres in size and bordering Gonarezhou National Park. One of the few remaining areas in Zimbabwe where rhino are still plentiful, Lonestar also hosts elephant, lion, leopard and buffalo. Gonarezhou means “Place of the Elephants” and this national park is home to substantial herds of these gentle giants. Set on the border of Mozambique, Gonarezhou features some spectacular scenery. A true wilderness area in Zimbabwe’s lowveld, even today it remains largely unexplored. The wide valleys of the Mwenezi Rhunde (rimmed by red sandstone cliffs) and Save rivers cut through the vast park, where lion, leopard, rhino and buffalo are encountered. Situated in one of the wildest and most remote parts of Zimbabwe, the valley of the Save River is part of a world biosphere area that incorporates the lowveld of Zimbabwe, south west Mozambique, and northern Natal, including Kruger National Park. The whole area constitutes one of the largest regions of bio-diversity on our planet. 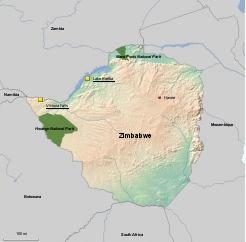 At the center of it, in Zimbabwe, is the Save Valley Conservancy, the largest owned wildlife conservation reserve. The Conservancy was originally created to safeguard the unique ecosystem that surrounds the slow-flowing watercourse of Zimbabwe’s second largest river. Covering nearly one million acres, the Conservancy comprises a wide range of diverse habitat types, as well as harboring an extraordinary variety of plant, mammal and bird species. Some of these species are indigenous to Zimbabwe’s lowveld and some are among the most endangered animal species in the world. Set in the rugged, beautiful wilderness of the Zambezi Valley escarpment, Chizarira is one of Zimbabwe’s least known parks. The diverse range of habitats found within Chizarira contributes to the wide range of animals and plants that live here. Elephant, buffalo, lion and leopard are common as are kudu, bushbuck and sable. Bird watchers will delight at the sight of crowned eagles, black eagles and Pel’s fishing owl. A highlight of a visit to Chizarira is a walking safari with a licensed guide. These unrestricted walking safaris are for the nature enthusiast looking for a genuine wilderness experience. The Midlands Province town of Masvingo takes its name from the Shona word for walled-in enclosure, which is in reference to the famous Great Zimbabwe ruins. Great Zimbabwe is renowned as the largest and most significant medieval city in all of sub-Saharan Africa. These 13th century stone ruins, the most spectacular structures south of the Sahara, are at the heart of the country’s historic past, testifying to the civilization Zimbabwe possessed while Europe was still enmeshed in the dark ages. Hwange is Zimbabwe’s largest national park – a spectacular 4,600 square miles forming the northeast border of the Kalahari Desert of Botswana. The park is famous for its huge herds of elephant and buffalo. More than 100 different mammal species reside here including lion, leopard, giraffe, hippo, crocodile, cheetah, zebra, jackal, wildebeest, many types of antelope and over 400 species of birds. The park includes a number of habitats including Kalahari sandveld, mopane woodland, river courses and pans. The waterholes found throughout the park support the rich wildlife and may reward you with views of the diverse animal population. Studded with islands, fringed by mountains and set aglow by spectacular sunsets, this inland sea has a rare solitary beauty. With the damming of the Zambezi River in the 1950’s and the subsequent flooding of the Zambezi Valley, Lake Kariba was formed. Today, Kariba is a haven for animals, birds, fish and people seeking recreation on its shores and waters. A number of wildlife sanctuaries surround the shore, with Matusadona National Park being the finest. Here the visitor will find large herds of elephant, buffalo and hippo. The skeleton remains of flooded trees, the vivid sunrises and sunsets and the wildlife make Lake Kariba an interesting and unique place to visit. Mana Pools National Park lies in a remote, unspoiled area which stretches 200 miles to the Mozambique border. The spectacular wildlife area of the Zambezi Valley is one of the few remaining regions still unchanged by modern man. The combination of forest, river and mountains attract a bewildering array of wildlife. A rift valley floor, stretching to Mozambique, is bisected by the life-giving Zambezi River. The whole length of this river is a protected wilderness area. The gem of this river is the Mana Pools National Park, which fronts the river for 50 miles and supports one of the richest wildlife concentrations in southern Africa. The Zambezi flood plain dominates much of the scenery. Elephant, buffalo, lion and leopard are among the large mammals found. The forest bordering the river contains ebony and mahogany trees, which in turn, provide a haven for birds. Canoeing on the Zambezi, with its slow pace and unique vantage point, is a popular activity here. Hundreds of hills supporting thousands of precariously balanced rocks give the 170 square mile Matobo National Park one of the most unusual landscapes in Africa. The region was inhabited by nomadic hunters 20,000 years ago who left a legacy of rock paintings. The brooding silence of the massive rock formations gives the Matobo a unique atmosphere. These hills hold secret, sacred places and are the spiritual home and refuge of the Matabele and the long-vanished Bushman tribes before them. The Matobo Hills, near Bulawayo, are also home to the white rhino, sable antelope, leopard and klipspringer. The world’s greatest concentration of black eagles soar above Matobo’s granite mountains. In addition to game viewing by vehicle or on foot, there are expeditions to historical and scenic sites among the hills. Bushman paintings, dating back hundreds of years, can be discovered and some of the finest examples of this ancient art are found in caves of the Motobo Hills. Visits to nearby African villages provide an opportunity to see how local people live and to buy some native crafts. Falling for Victoria is easy. On November 16, 1855, Dr. David Livingstone instantly did, naming the Falls after his queen. Victoria plummets 350 feet straight down, her mists soaring 1,200 feet straight up! Victoria Falls is the largest and perhaps the most beautiful Falls in the world. Here the Zambezi River is over a mile wide and plunges into a vertical abyss across its entire width. The force of the falling water sends spray clouds high into the air, giving rise to the African name of the Falls, “Mosi oa Tunya,” meaning the smoke that thunders. It is said that when David Livingstone discovered the Falls, they inspired him to have written in his diary that “scenes so lovely must have been gazed upon by angels in flight.” A rainforest along the first gorge provides a magnificent natural observation gallery. In addition to viewing the Falls, the visitor may enjoy such activities as a “sundowner” cruise on the Zambezi River, white water rafting below the Falls, airplane or helicopter flights to get an aerial view of the Falls, displays of traditional tribal dancing and shopping for local crafts. Few African capitals make such a deep impression on the visitor as Harare. On the drive from the airport, the city appears on the horizon almost like a mirage, a string of gleaming high rise blocks flashing in tantalizing glimpses between the jacaranda trees. The capital of Zimbabwe, Harare is a picturesque city with a cosmopolitan flavor in its broad streets, spacious gardens, and impressive architecture. Harare is a place for shoppers. Local craft centers abound, offering artifacts, which portray the roots of many cultures. Other places of interest include The National Art Galley, Chapungu Sculpture Garden, The National Archives, Doon Estate, Patrick Mavros jewelry studio as well as several world class golf courses. Harare offers a high quality of hotel accommodation both in the city center as well as smaller lodges located in the surrounding suburbs. The second major city of Zimbabwe is Bulawayo, once home to the dynasty of fabled Ndebele kings. Today it is one of the county’s major tourism, commercial and industrial centers. Bulawayo is a spacious and attractive city, with extraordinarily wide boulevards. In some sense one feels in a time warp as Bulawayo has a distinctive “50’s” feel. It is the capital of the Matabeleland region, which stretches from Beitbridge in the south to Victoria Falls. There are several places of interest to visit in and around Bulawayo but of particular importance are the Natural History Museum, Railway Museum, Khame Ruins, Chipangali Wildlife Orphanage, Mzilikazi Pottery, Tshabalala Game Sanctuary and Centenary Park.